That’s what I would call looking up to realize that in a city with hundreds of thousands of vehicles registered, you’re behind the exact same vehicle that prompted a blog post several months about signs from the universe. 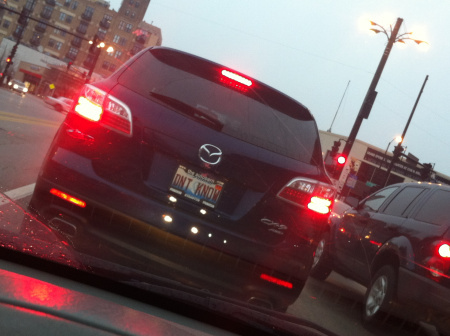 The same car, same license plate proclaiming with that loaded phrase that carries so much weight with me. And nipping at its heels, the same unanswered questions, the same desire to find some hidden, emotional significance, the same residual feelings that leave me feeling raw and wrenched apart. Performing at Untitled for Halloween with the incomparable Lady Jack. I heard those opening violins right trailing out of my speakers right as I pulled up behind the van. I froze, staring at the license plate, wondering about the synchronicity of it. What it all meant. Because for someone as emotional and watery as me, every little coincidence had to mean something… right? I was always searching for some deeper, hidden, sometimes unfathomable significance. Make peace… my heart whispered, before my brain could slap a protective hand over its mouth. Ah, that old romantic idea: Try to fight for resolution, peace, and call a cease-fire. Try to explain myself one more time in a vain attempt for resolution. Not to win anything back or regain old ground: just a simple, optimistic effort to rid the world of just a little of that fierce hatred I still felt rippling in burning waves across the empty space and radial silence. A different version of myself might have tried to explain yet again, but when it came down to it, I kept arriving at the same conclusions: I had to leave. We weren’t right together. And if I really cared about this person, is was better to remove my brain’s gag on my heart and let it speak freely. And deep down I know that I will never be forgiven or understood, no matter how I try to explain it. So my whole heart wished him well, while my brain switched songs and drove away. Here’s a half improvisation/half choreography piece from March 2, 2013 at the After Party Show in Chicago at Studio Be.